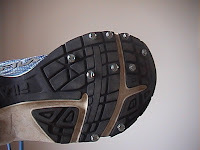 One way to make running on trails and roads that have ice and snow a little easier is to put hex head screws on the bottom of your shoes. You can't feel them under your feet and they don't weigh the shoe down. 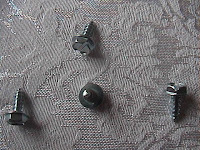 sheet metal screws and sell for under $2.00 for 20. Warning: Running on ice and snow is not recommended. 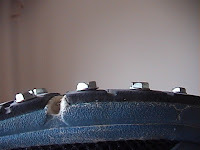 Although hex head screws may make running on ice and snow easier, they are not guaranteed to keep you off of your behind. Very helpful post - this Christmas a family member got me a pair of rubber thongs that slip over your running shoes, with hex screws on the sole. They could have saved themselves a good deal of money by just buying me some hex screws! I've seen some type of rubber things that you put under your shoes. They must really add weight to your shoes. Did they come with a receipt?